Is Easter racing up on us? I know it’s pretty much only a month away, and that time will fly! And who doesn’t love to prettify the ‘ordinary’ things in life? An ordinary Chocolate Egg (currently on special offer, 2 for £1 in my local spar!) look so much more ‘fab’ when encased in one of these stunning boxes! I will at this point put in a link here to France Martin who gave the fantastic tip about how to get diagonal print on a piece of DSP to lie either vertically or horizontally. That woman is a genius. Bonkers (in the best way ever! ), but a genius! Anyway, I love this box. 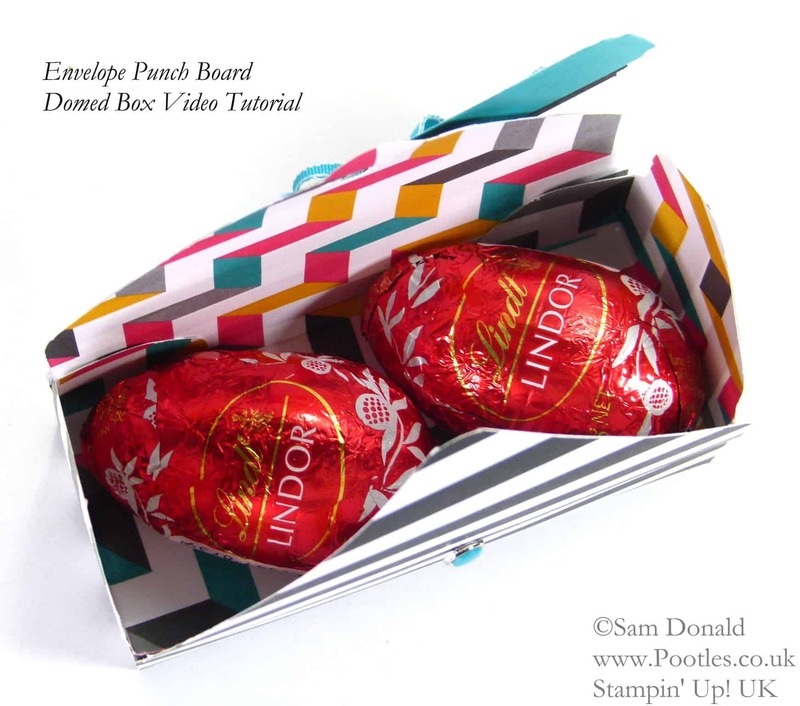 Not just because it uses my adored envelope Punch Board, but because it holds 2 chocolate eggs! Yummy! And it has such a fun finished look to it doesn’t it? then punch ONLY the remaining ‘unpunched’ score lines to create 2 punched areas on each side.